French Emblems: Emblem: Plus croit vertu quand plus fort on l'opprime. 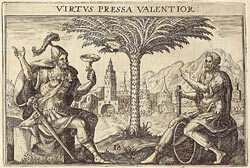 VIRTUS PRESSA VALENTIOR. Plus croit vertu quand plus fort on l’opprime. beau incendiaire du lieu de son origine. Ne se lasche au travail, mais vertueus insiste. Et dedans le peril à bien faire il persiste. 1. The story of Marcus Atilius Regulus, Roman consul and general in the Punic Wars, famous for his behavior as a prisoner at Carthage, sacrificing himself rather than agreeing to a prisoner exhange. Seneca, De providentia, 3.9. 2. Themistocles was an Athenian general and politician during the Persian wars, who in the end of his days lost the confidence of the people and offered his services to the Persians instead. But according to one version of the story, he committed suicide rather than have to fight against fellow Greeks. Thucydides, History of the Peloponnesian War, 1.138.